Nearly 15 years ago, I was working for a large International Software firm. We were all put through an education program which culminated in a conference presented by a high-ranking business-change consultant. He outlined a story which I remember today and which I would like to share. He was talking about hotels. These are essential for business trips and at first seem great. After a while however, they become mundane and all hotels seem to merge into one. There are differences, but these tend to be minor, and in fact the differences start to be negative ones. For example, the chocolate mint on your pillow, freshly placed there day after day, stops being a positive differential for hotels and quickly becomes seen as the norm. The fact that it IS there is glossed over, but when it is NOT there, it becomes a big thing. It in fact becomes a negative differential. The result is that hotels which originally saw the chocolate mint as a great way to impress, find themselves locked into a situation where they have to provide this service in order to stand still in the competitive stakes. There is no real added benefit – the guest barely sees the chocolate, and worse still, may totally ignore the chocolate. However by not providing the chocolate, the guest feels let down and has a disappointing stay at the hotel. In order to impress, a new and improved positive differential must be found, and in the case of the visiting consultant, he experienced this late one October night while giving a course about Nottingham website development. On entering his hotel room, he glossed over the chocolate on the pillow, the mini-bar and the artfully arranged and carefully chosen décor. In fact, his trip could have been one of any until he got undressed and was about to soak in his bath. He then looked for the free soap (again, presence was expected, absence would be a negative) and his gaze fell upon a rubber duck. 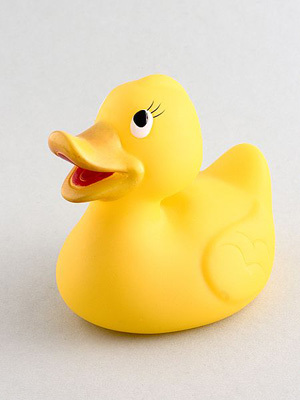 The idea of placing a toy rubber duck in the bath was genius. It was above and beyond his expectations and so placed the hotel in a positive differential. It was the ‘wow’ factor that was enough to ensure the consultant stayed at that same hotel the following month when he came back to give his advanced Nottingham web design. The rubber duck exceeded expectations. It gave the hotel a positive differential. Last week, I had a French client who wanted a photo gallery to show his work. Almost every website design includes a page for this as images really do stand out and speak a thousand words. In fact, websites that have galleries are considered the norm, and ones without are now seen as a negative differential. The format of the photo gallery was not specified in his Business Website Design specification, and so I decided to implement one that I have recently discovered – it is the cloud carousel from Professor Cloud. This utilises the jQuery library which I started to praise in the article Designer Web Design - Websites just got better, and it provided the ‘wow’ factor I was looking for. Not only do I get a great looking website for the Net Quality Web Design Nottingham’s portfolio, but the client is over the moon, and the visitors to his site are blown away by the greatest looking carousel in existence.